Masterclass spotlight: Meet Coach Cane! 04 Jul Masterclass spotlight: Meet Coach Cane! Jonathan Cane – better known to his athletes as Coach Cane – has been working with runners, cyclists and triathletes for over two decades. He holds a Master’s Degree in Exercise Physiology and has been certified by the American College of Sports Medicine, USA Cycling and the National Strength and Conditioning Association. 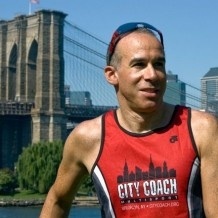 Jonathan is Founder and President of City Coach Multisport, and has coached for Nike’s Run NYC program since 2002, and for JackRabbit Sports in 2004. Jonathan is co-author of The Complete Idiot’s Guide to Weight Training, has written for Triathlete Magazine, NY Runner, and Metro Sports Magazine, and has been a featured speaker for NY Road Runners, Nike, Chelsea Piers, Hospital for Special Surgery and Triarq. Coach Cane lives in Harlem with his wife, Nicole Sin Quee (a.k.a Mrs. Coach Cane) who is a high school math teacher and nationally ranked triathlete, and their newborn son Simon. He will be leading an informative lec-dem including topics such as running cadence, foot strike & posture. He’ll also touch on running drills & their role in proper running form. Bring your Qs, comfortable attire & running shoes! Wednesday, July 25: 6:30-7:30pm; $20. Register here!